And the results point to an urgent business imperative: Repair the way we communicate with employees at work or risk crippling financial consequences. At a time of economic uncertainty and record-low unemployment, a shocking number of U.S. employees are stressed, unhappy and ready to quit. 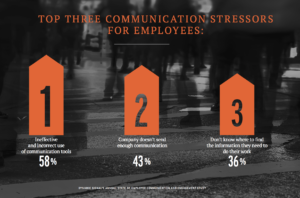 According to our 2019 findings, 80 percent of the U.S. workforce reports feeling stressed because of ineffective company communication –­ a 30 percent jump from just one year ago. 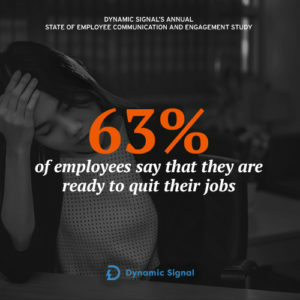 Our 2019 #DySiStudy which surveyed 1,001 U.S. employees, also found that 63 percent have wanted to quit because ineffective communication interfered with their ability to do their job ­– almost double from the 33 percent in 2018. It’s clear: Companies aren’t prioritizing Employee Communication and Engagement highly enough and employees are suffering. Seventy percent of employees feel overwhelmed because of broken communication methods and fragmented information, while 78 percent of employees surveyed said improving Employee Communication and Engagement should be a higher priority for their current company – and leadership should be concerned. More than half of employees (60 percent) wouldn’t confidently advise keeping their CEO because of the poor communication they’ve experienced and another 17 percent of employees would recommend firing their CEO based on how the company communicates to its employees. What’s even more disappointing is that a majority of employees (53 percent) don’t feel like their company communicates with them in a way that makes them want to be an advocate for the organization, even though a staggering 83 percent say they WOULD be an advocate if employee engagement were better. So how bad can this get? Well, we did some math. On average, the cost to replace an employee is 33 percent of annual salary according to the Work Institute. At a Fortune 500 company with an average employee salary of $73,000, each employee could cost around $24,000 to replace. With the average Fortune 500 company employing more than 52,000 workers, this can leave those large companies with an average risk of more than $1.2 billion in turnover-related costs. We have reached the billion-dollar breaking point. But Employee Communication and Engagement can reduce your exposure and risk. In fact, it’s a critical element for doing so. Organizations with higher employee engagement see 24 percent greater worker retention, 21 percent higher profitability, and 17 percent more productivity, according to Gallup’s State of the American Workplace report, released in 2017. And we found that U.S. employees clearly value more effective Employee Communication and Engagement at their companies, making them hungry for improvement, even more than compensation. 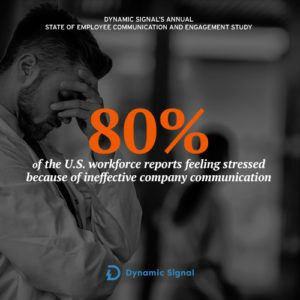 Many Dynamic Signal customers are already getting ahead of these potentially detrimental trends by working to connect and engage their employees. We’ve seen the results first hand and we know that when you improve the employee experience and activate your workforce, you can transform your business. In the meantime, take a look at the full study. We’d love to hear your thoughts! Any surprises? Theories as to why we’ve seen such significant increases in stress and employees wanting to quit? Tweet to us using hashtag #DySiStudy and join the webinar next week.